Eiserne Regel: Lock it or loose it. Atlantic Standard Time (AST) = Eastern Caribbean Time = GMT/UTC -4. 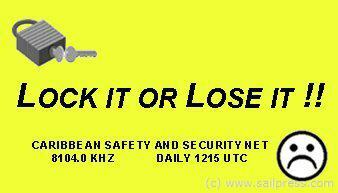 The Caribbean Safety and Security Net is heard on SSB channel 8104.0 Khz each morning at 8:15 AM Atlantic Standard Time (12:15 UTC).